Unless you’ve been living under a rock for the last week or two, you’ve likely noticed that Curiosity has landed on Mars. 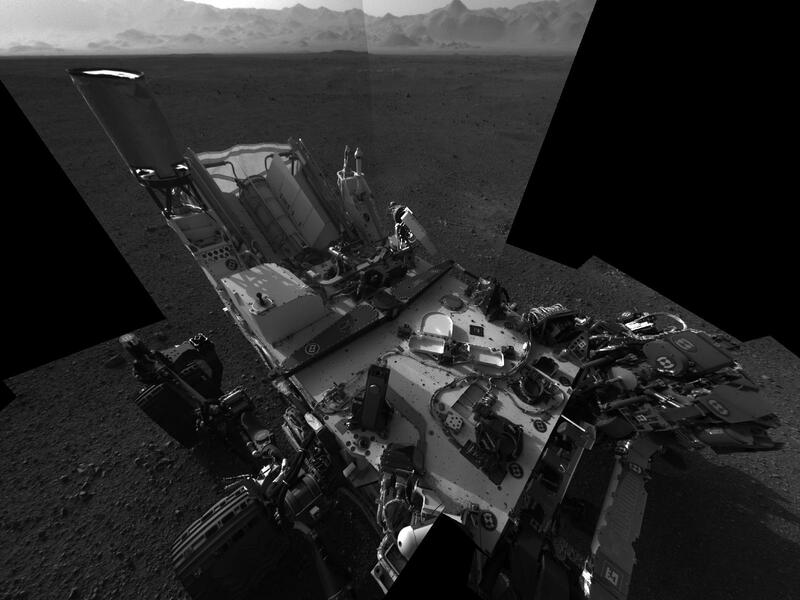 Curiosity is NASA’s latest Mars Rover designed to look for signatures of life on the Red Planet. It’s quite a different mission than Shuttles throttling through space, but it is still consistent exploration into the beyond. NASA was established in early 1958 in direct correlation to The Cold War with the Soviet Union. 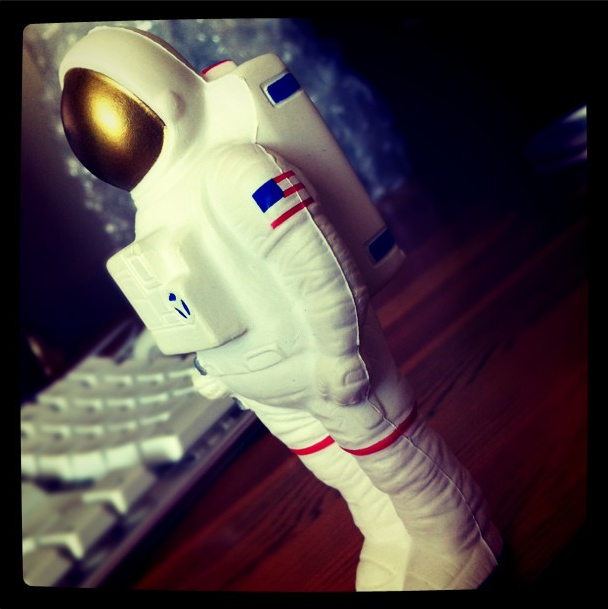 Perhaps the heyday of NASA was during the Kennedy and Johnson Administrations when Astronauts traveled to the moon. But the nature of the world slowly changed, even in the 1960’s, major television news failed to cover launches and landings unless there was some degree of unforeseen danger. Apollo 13 is an excellent example of the lack of media coverage until a crisis erupts. Move into the Shuttle program, which began in 1981 and ended in 2011 with the final landing of Shuttle Atlantis. In between there were several launches, landings and heart wrenching accidents. Kids applied to Space Camps and eagerly studied the images of the Hubble Telescope, but for the most part the many NASA programs progressed in some degree of obscurity. NASA is the king of creative social media. They are a bureaucratic, federal agency, yet some how find the way to be real, transparent and gain support via new media solutions. Mainstream TV doesn’t broadcast landings or launches anymore – gone are the days of the Apollo missions, yet more and more people are intrigued, interested and dedicated to NASA’s success. Curiosity was named in a social competition, by 12 year old Clara Ma, they have educated and made a fans for life with various launch and landing Tweetups, Astronauts have logged into Foursquare from space, and absolutely breathtaking photographs from the likes of @AstroRon have been tweeted from the International Space Station, to name just a few. If you’re a space nerd, like me, having real-time, personal access to all things NASA is pretty damn cool. But what’s the practical application for the field of Emergency Management? While watching the live UStream of Curiosity’s landing (here’s a play by play), it occurred to me that the operations center looks largely like an Emergency Operations Center (EOC) and while we may hesitate to open up EOC operations to the world via live streaming video, we could easily open portions of our work to better educate and prepare the public we serve. In the previous blog, SFDEM told Twitter followers, We Hear You. We lifted the kimono a bit to explain why we do what we do and how we will try better to bridge the gap between information and overwhelm. It’s a first step, but it cannot stop there. If emergency management, as a field, desires to create a culture of preparedness and build resilience it has to be more than simple one-way messaging. NASA cannot expect to create fans of space exploration by simply showing the latest launch, photo or tragedy on television and likewise emergency management cannot assume that the images of the latest disaster, or directions to make a kit or pick a meeting place will create a more resilient and responsive community. NASA has proven that it takes interaction. Concerted, direct conversations, unique, engaging opportunities to educate, inform and inspire generations, both old and new, to the wonders of science and space. Can the field of emergency management do the same for preparedness and resilience? Alicia D. Johnson is the Resilience and Recovery Manager at SFDEM. She is a strong advocate for innovation in disaster and human resilience. She can be reached on Twitter – @UrbanAreaAlicia. 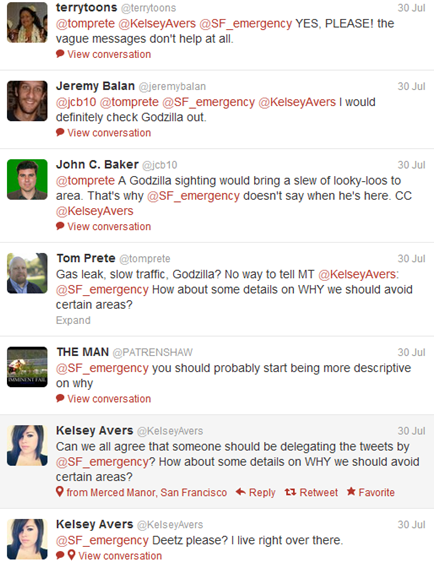 Since we first started using social media in spring 2009, @SF_Emergency has become a major public information tool for DEM. In this journey of learning how to integrate a culturally unprecedented mode of communications (we liken it to when the internet was first used), we have learned A LOT about crafting messages for the public on this medium, of particular importance being how to master the art of…brevity. With that magical 140 character maximum, us govies have really worked that muscle. So, in the process of learning to craft succinct messages, we adopted a formula of sharing only the basics. This formula predominately includes the 1) what to do (e.g., avoid the area); and 2) what geographic area is impacted. So, as we move forward on our social media journey, we are becoming aware that our formula (developed to honor brevity and unnecessary information that could cause more trouble than help) is missing something: the why. That said, we want you to know we hear you – you want more details when we advise you to avoid an area. I thought I’d take a minute and let you know why things are done the way they are and tell you what we’re going to do in order to try and meet your needs. Good points! We hear you and you are getting more info (especially if the reason to avoid the area is Godzilla)! First, the why….simply put, sometimes the information you want isn’t ours to give. This is especially true of law enforcement incidents. In order to respect the wishes of the lead agency and make it easier on our Duty Officers, we adopted the generic “avoid the area” message as a courtesy notification to our followers. The idea was simply to provide a little heads up so that you could not get stuck in a traffic jam, find yourself stopped at a yellow tape line or waste a lot of effort trying to get someplace that you won’t be allowed to go. If the situation warranted a shelter in place or evacuation –we’d say that. The message wouldn’t be “avoid the area” – it would be “get out” or “stay inside.” Often shelter in place orders are delivered by officers – the short answer here is that if there is an action you need to take, we’ll make sure you get that in a very clear way. So, why, you ask, can I find out the details from other sources – like @Emergency_in_SF (there’s others, were not endorsing this one in particular) or SFPD? Well, in the first case it’s because private entities are not bound by the same rules we are – i.e. they’re not a City agency. To be honest they get it right 80 percent of the time. In the other case – SFPD – they are probably the lead agency and if they want to share info they can. Now… Here’s what we’re going to try in an effort to meet your needs and still stay within our parameters. We will begin to state whether an incident is law, fire, transit, or traffic. Then, if we see another stream is reporting details that are right, or mostly right, we’ll retweet it. We’ve tested this out over the last few days and have received some good feedback. We appreciate your support and we are listening. Keep letting us know how we’re doing! 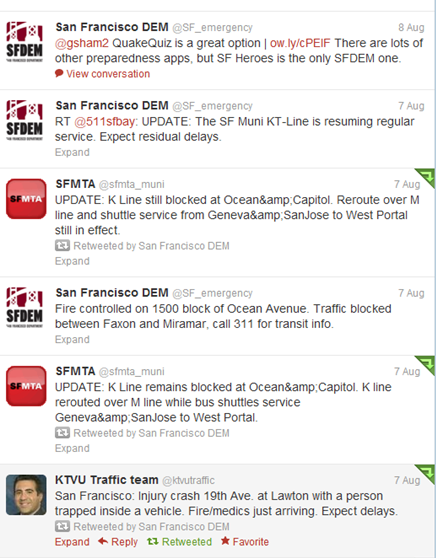 @SF_Emergency’s more detailed tweets and/or retweets from informed sources. Occasionally, staff members at San Francisco DEM have an opportunity to travel abroad. They frequently write back with their observations. The following is the third and concluding observation from Assistant Deputy Director, Bijan Karimi, during his visit to Hanoi, Vietnam. 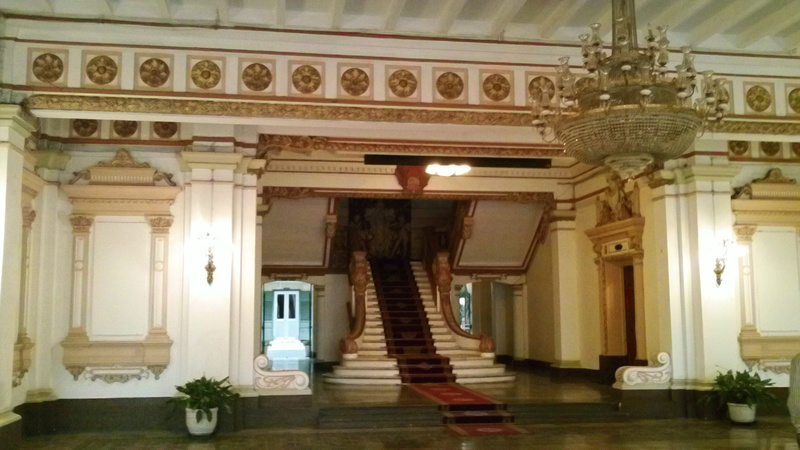 HCMC vs Saigon – Officially the city name is Ho Chi Min City; however, this name was given by the north after the civil war and many locals still call the city Saigon. After a two hour flight to Ho Chi Min City we met with the American Chamber of Commerce representative to get an idea of the local business landscape. He highlighted the significant differences between HCMC and Hanoi, driven primarily by the experiences during the American War (their name for the Vietnam War). Saigon (what locals still call it) is the economic engine of Vietnam and ~10 million people call it home. Our first meeting with officials was the most important one. We heard from the Vice Chairman of the People’s Party about his concern for improving disaster preparedness to deal with infrastructure issues, climate change & flooding, and sustainable development. 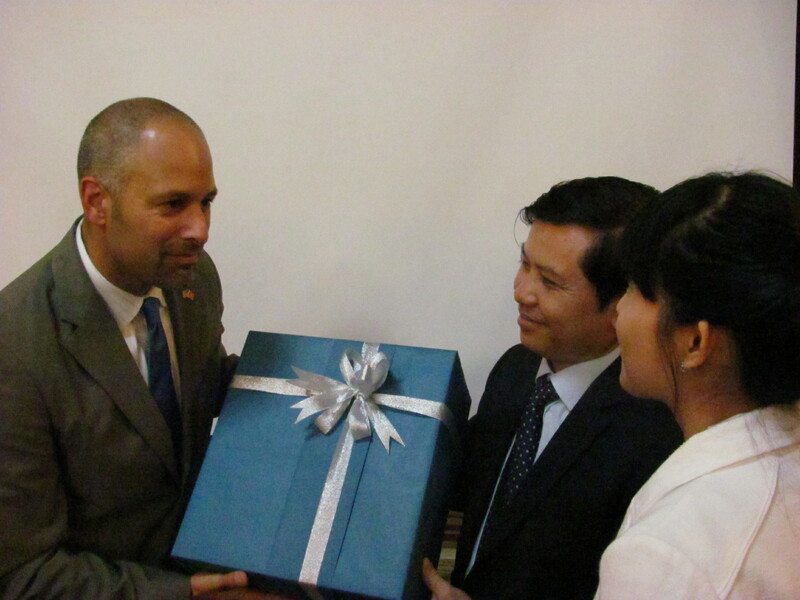 We exchanged gifts from our jurisdictions, took a few photos and promised to continue the conversation Monday. He also indicated he looks forward to adding substance to the HCMC-SF relationship through this exchange. The day ended by meeting with other party officials and discussing areas that we would explore during our meetings on Monday. After five non-stop days the team had the opportunity to slow down a little and enjoy some sight-seeing over the weekend. We visited the Remnants Museum which tells the story of the American War from the Vietnamese perspective, toured Independence Palace (capital of S. Vietnam during the war) and travelled to Cu Chi to view some of the tunnels used by the Viet Cong (VC) to move underground between Saigon and the Cambodian border. 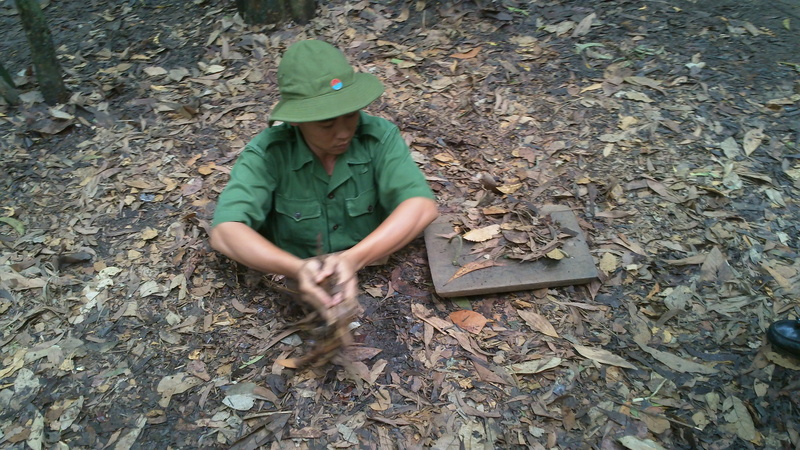 These tunnels were used by the VC to mount surprise attacks on an American base that had unknowingly been built right on top of the extensive structure. During our final day in Saigon we met with members of the Flood Control, Urban Flood Control and Climate Change Steering Boards. Each expressed concern for improving disaster preparedness and was open to future exchanges where we can discuss specific techniques. 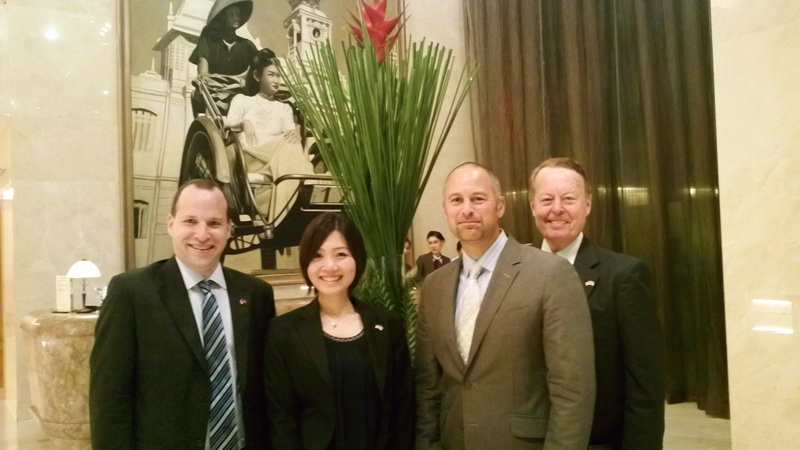 After a meeting with the local VCCI chapter we concluded our visit to Saigon as dinner guests of the Vice Chairman. • Pig’s ear doesn’t taste like much. Durian smells like decaying fish, has the consistency of an avocado and tastes like fermented pumpkin. • You are expected to haggle when in the markets. Be sure to give it a try. Practice at one place and then work up to the thing you really want to buy. • A cut on any part of your body puts out a ‘welcome’ sign for bacteria and they move in right away. Make sure to have band-aids (not that they actually stick) and some Neosporin in your travel first aid kit. • Have an open mind – never know what new experience will come your way. • Learn a few phrases in the native language – it goes a long way to break down barriers. • Learn to use chopsticks. • Have fun. It’s easy to focus on not having the comforts of home, but then you miss out on new experiences. • Don’t be an ugly American; represent your country well and be respectful.